Kanji Sieve for Mac v0.3 is ready. Unfortunately due to pressing matters elsewhere this is about as far as I can go for now. Unavoidably that means it could be a few months before a Windows version appears. Rather than sit on the Mac version which is functional, now that I have permissions for the Chuta dictionary and Flashcard Deluxe features I decided to upload it. The windows version has a huge problem at the moment. A core screen is just not rendering properly no matter what I try. Ugly I could live with but this is completely unfunctional, the css doesn’t render properly and the Japanese becomes mojibake. I *think* it is due to the Internet Explorer version I am using under XP, but until I can explore this under Vista or Windows 7 I’m at a complete loss. If I can find the time I’ll do my best to get a Windows version working. Although I’m now leaning towards just cutting this function from the windows version rather than chase after workarounds in Internet Explorer. What does Kanji Sieve do? It takes a piece of text entered by the user and first it breaks down the kanji usage to show you which kanji are used by grade and how often they are used in the text. Then it submits the text to chuta.jp. Primarily this is so the text can be parsed to allow individual words to be extracted into a list. 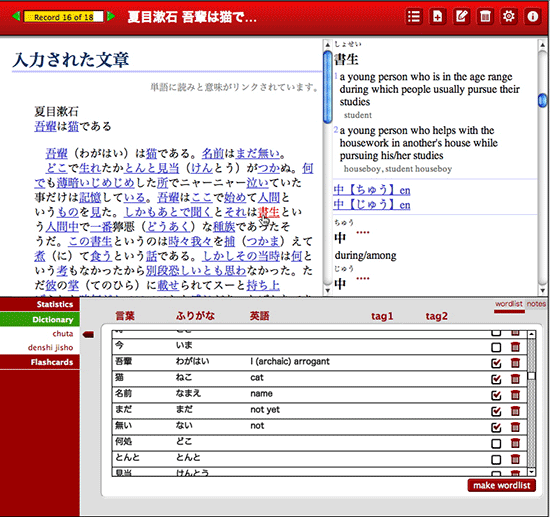 Using online dictionaries the user can then put meaningful definitions to the entries in a wordlist. Finally a tab-delimited flashcard deck is generated that can be used with the iOS app Flashcards Deluxe. If multiple pieces of text are entered a listing of the 20 most frequent unknown kanji can be generated, unique to the user and the pieces of text they find interesting. My thesis is that the 1006 kyouiku kanji are the best target for Intermediate JSL students. The grade school groupings break these down into manageable chunks. If you follow the grade school groupings there is also a wealth of Japanese learning material available. Keywords are only a tiny part of learning a kanji. Indeed thinking about it as learning to read and write, rather than learning kanji would be much more useful. That said you need to learn by reading and using Japanese. Reading targeted at your interests, providing you with a vocabulary you might actually use. SRS systems can help but words and characters need context and to be meaningful in order to be remembered and used properly. Kanji Sieve may help with this part of the process. I have ideas about the process of learning individual kanji, which I hope to cover in a post some day. I feel it needs several elements. You need to find meaning in the characters – by breaking them down and understanding their structures. You need to break the task down into manageable chunks. – 2000 kanji isn’t a manageable chunk. You need a variety of methods and tasks – to stop you getting bored or only being able to function in one method. You need to find it immediately useful – to be able to use words in real life situations. Also thanks to Ernie the maker of Flashcard Deluxe for permission to incorporate a link to his app. You will also find a movie demonstrating the solution on this page.